*Due to the small number of standouts this week, the number of prospects on this hotlist were lowered to 7. Nate Smith started two games this week: one for the High-A Inland Empire 66ers and another for the Double-A Arkansas Travelers. Smith’s start on Monday saw him going 6 innings while striking out a career high 8 batters, retiring the last 8 hitters in order. Following the game, Nate Smith would be promoted to Double-A Arkansas along with fellow pitcher, Kyle McGowin. Both Smith and McGowin have followed a similar path thus far. They were both members of the 2013 draft class, McGowin taken in the 5th round while Smith was chosen in the 8th. Both pitchers skipped Low-A Burlington to start the 2014 season and now both are making another jump to Double-A. Smith made his Double-A debut on Sunday and did what he has done best this year, win games. Despite facing higher competition, Smith’s Double-A debut might have been his best start of the year. Smith matched his season-high 8 strikeouts and only allowed 6 base runners (1 walk and 5 hits) in 7 complete innings. Of the 7 innings that Smith pitched, 4 of them were perfect. His one mistake ended up being a home run to the Missions' second baseman, Casey McElroy. Smith has been on this hotlist every week and I can bet you this won’t be his last. Eric Aguilera has been swinging a scorching hot bat for the Burlington Bees. 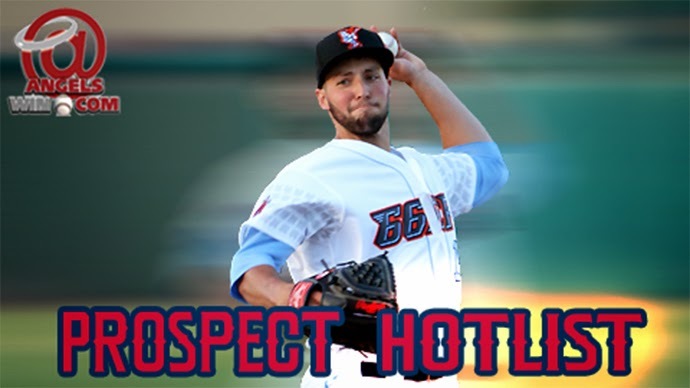 With a near .500 batting average in his past 10 games, it is hard to deny Aguilera a spot in this week’s prospect hotlist. Eric was chosen in the 34th round of the Angels’ 2013 Amateur Draft. Originally an outfielder, Eric was moved to first base last year in Orem. The newly converted first baseman has been quietly hitting the ball well since being drafted, posting a slash line of .306/.341/.539 last year with the Orem Owlz. Being a four-year college player, Eric could be a fast mover through the system. He has already fared well in a short stint with the High-A Inland Empire 66ers, hitting .279. The Angels should be counting their blessings since Michael Roth has cleared waivers, as he has been dealing ever since. Since clearing waivers, Roth has won 3 of his 4 starts while posting a microscopic ERA of 1.29. His rates have been impressive as well. With his deceptiveness, Roth has been able to keep hitters off balance with a groundball-rate of 52% while only walking 6% of the batters he has faced. Don’t be surprised to see Roth up in the bigs at some point this year. Chad Hinshaw was a four-year starter for the Illinois State Redbirds before being chosen by the Angels in the 15th round of the 2013 Amateur Draft. Hinshaw owns the Illinois State record for most career stolen bases with 108 and continued to flash his speed and defensive prowess this year for the Burlington Bees, stealing 16 bases to lead the team. Hinshaw has also hit for some power this year; smashing 8 doubles, 2 triples and four home runs (.581 SLG%). 4 of his doubles have come in the past 10 games. Overall, Chad has shown an above-average eye at the plate with a walk-rate of 9.6%, but also has a K-rate of 27.5%. Both Eric Aguilera and Hinshaw were teammates in Illinois State and were two of the four Redbirds to be chosen in the 2013 draft. Mark Shannon was one of the few bright spots for this week’s 66ers team. Since Monday, Shannon has hit .409 along with back-to-back 3-hit games. He also roped 5 doubles in that span. Shannon has been very consistent since being called up to High-A early May, only going hitless in 5 out of 20 games played with the 66ers so far. Zach Borenstein was swinging the bat well and earned a promotion to Triple-A Salt Lake on Sunday. Before his call-up, Borenstein was on an 8-game hitting-streak where he was hitting .352 to go along with a monstrous .706 slugging percentage. Like the rest of teammates, Borenstein was victimized by the unfriendly confines of Dickey-Stephens Park. A promotion to the much more hitter friendly PCL might help his numbers, but keep in mind that the level of competition is higher. Unfortunately, his debut in the PCL saw him striking out 3 times in 4 at-bats. Rondon hit safely in all but 1 game for the 66ers with a .280 average this week, bringing his average “all the way” down to .327. Rondon also hit a pair of doubles and a triple in that span. His batting average is good for 6th among the Cal League league leaders. Another positive note for Rondon is his pitch selection, only striking out two times in his past 10 games (40 at-bats). As Rondon gets accustomed to the level of competition, one can only assume his k-rate will lower and his bb-rate will increase. Rondon was known for his advanced eye up until this year, posting a 9% bb-rate and an identical k-rate of 9%. After going 1-12 the past two weeks, the Bees were finally able to win more than one game in a week posting a record of 3-4. An overall record of 17-34 puts them 15.5 games back from the division leader. Offensively, J.B. Shuck led the team this week with 8 hits and Efren Navarro made a splash in his return, going 3-3 with a home run and a double. As we all know, Josh Hamilton has been MIA after his first rehab start due to discomfort in his thumb. Ian Stewart also made his first rehab appearance on Sunday. The third baseman went 0-2 with a walk and a strikeout. Wade LeBlanc has been great his last couple of starts in Salt Lake, earning him a promotion to Anaheim at the unfortunate expense of the “Ace-Killer” Matt Shoemaker. In the pen, Yoslan Herrera has strung together 5 straight scoreless outings to bring his ERA to 1.32. LHP Brandon Sisk made his Triple-A debut on Sunday, pitching 1 scoreless inning while giving up no hits and walking 1. The Travelers had themselves a nice week going 4-2 to bring them within 1.5 games of the division leader. Second baseman Alex Yarbrough hit safely in all but two games this week and remains the league leader in hits and doubles. Other than the aforementioned Smith and Roth, Drew Rucinski had himself another solid outing, pitching 6 shutout innings. Relief pitcher Danny Reynolds made 2 appearances (2.0 IP) and struck out 4 while allowing no runs. Cam Bedrosian allowed his first home run of the year on Wednesday but that was the lone hit he gave up in three one-inning outings. No need to panic everybody, he’s still a beast. The 66ers continued their struggles going 2-5 this week. They are currently in last place in their division (13.0 games back). Sherman Johnson continued to show an excellent eye walking 5 times to 4 strikeouts. Mark Sappington continued to struggle with command in his Single-A debut, walking 7 batters in 5.0 innings pitched. Recently promoted Elliot Morris should be taking the mound tomorrow in what will be his High-A debut. Pitcher Dan Tobik, who was the Angels last selection in the 2013 draft, had himself a nice outing this week, striking out 7 batters in 5.1 innings of relief and only giving up 2 earned runs. He is slotted to make his first start of the season on Tuesday. The Bees won 5 of their 7 games this week, bringing their overall record to an even 24-24 (8.0 games back). Outfielder Mike Fish hit safely in all but one game while second baseman Kody Eaves collected 1 double, 2 triples and a home run. Harrison Cooney continued to pitch well in a two-start week. His start on Sunday saw him going 7 complete innings (the first time he has gone 7 this year) while only giving up 3 hits and 2 earned runs. Starting pitcher Yency Almonte made his High-A debut and pitched 5.0 innings of 1-run ball along with 1 walk and 4 strikeouts. After a rough start to the year, pitcher Alfonso Alcantara brought his season ERA down to 3.65.